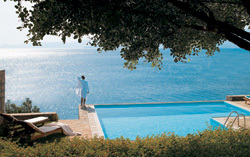 The ELOUNDA PENINSULA ALL SUITE HOTEL is the most exclusive hotel in Greece. 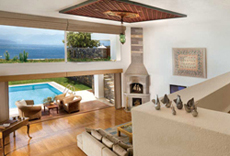 Uniquely positioned on a peninsular stretch of land, it overlooks the Mirabello Bay and the expanse of the Aegean Sea. The view is blue as far as the eye can see. 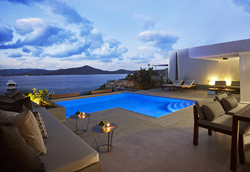 ELOUNDA PENINSULA ALL SUITE HOTEL is reached by a private road that leads to the lounge area on the top floor. Its expansive verandas make you feel like you are on the bridge of a flagship. The American-style a-la-carte breakfast is to be enjoyed with the most spectacular views of the bay. The gourmet restaurant Calypso promises a unique culinary journey to its devotees who return regularly to dine in exquisite ambiance, next to a turquoise pool that seems to overflow into the sea. The impressive Kelari wine cellar, home to a truly remarkable selection of Greek and international labels, offers private tasting as well as private dining for up to 8 guests. The Koh Pan-Asian restaurant, located just above sea level at the very tip of the peninsula, is the most magical setting in which to enjoy culinary delights from the Far East. 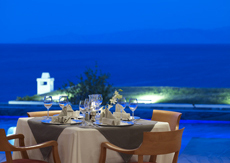 More dining options are available at the neighbouring sibling establishments, elounda mare Relais& Chateaux hotel and porto elounda GOLF & SPA RESORT, through a dine-around scheme which also includes the various weekly themed evenings, so as topleaseeven the most demanding palate. Elegant attire is expected in all restaurants (no shorts or T-shirts in the evening). Please note that the restaurants' operation schedule might vary due to weather conditions. 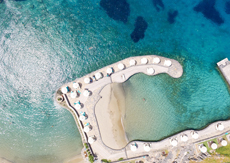 The ELOUNDA PENINSULA ALL SUITE HOTEL offers uniquely outstanding accommodation, designed and furnished to the highest standards, providing a truly luxurious environment. All accommodation has an uninterrupted view of the ever-changing colours of the Mirabello Bay and the individual heated seawater swimming pool brings thalassotherapy directly to your terrace. Exclusively for guests of the ELOUNDA PENINSULA ALL SUITE HOTEL, private screenings of films are available at the 50-seat cinema theatre, designed and built according to THX standards with the best in digital surround sound. Relax on the hotel’s private beach, where reserved sunshades and loungers are available for each suite independently, fully serviced with refreshments and snacks. A lovely indoor pool and spa area are also reserved just for guests of the ELOUNDA PENINSULA ALL SUITE HOTEL, including a gym with Cybex® equipment, a finish sauna, and an authentic Ottoman Hammam. Yachting cruises sail off daily from the resort’s marina, exploringthe coves and anchorages around Elounda. Whether in the one-off 82-foot yawl by Steve Bazell or the powerful58-foot Posilippo motor yacht, the azure waters of the Mirabello Bay beckon to be discovered in style. 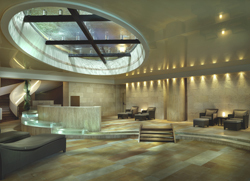 The repeatedly awarded Six Senses Spa™. World’s Best Spa according to the Sunday Times Travel Magazine (December 2007), provides a truly relaxing and revitalizing experience, through many forms of holistic healings to balance the senses. Its unrivalled range of signature treatments focuses on health, beauty, pampering, stress reduction and recuperation using pure, natural and environmentally friendly products. The luxuriously appointed spa spreads over 2,200 m², including a hairdressing parlour, setting unique standards in spa design. A la carte dinner at the Italian restaurant Aglio e Olio. Kid’s Ark, a complete childcare centre of unique design, with a Creche for children from aged between 4 months and 4+ years and an activities centre for kids from 5 years of age with water slides, table-top games and a basketball court. The Aegean Conference Centre at PORTO ELOUNDA GOLF & SPA RESORT conforms to cutting-edge specifications and incorporates years of experience in functional design and facilities. Extending over 1500m2 of indoor spaces with the additional benefit of another 300m2 of covered outdoor verandas, it comprises five multi-purpose halls of various sizes, which can all be joined and separated as needed, while enjoying an incomparable view to the resort’s golf course and the sea. 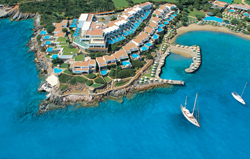 Shuttle service is available to guests who wish to enjoy the Six Senses Spa, golf, restaurants, bars, shopping etc. 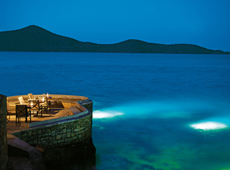 at the neighbouring sister establishments, PORTO ELOUNDA GOLF & SPA RESORT and ELOUNDA MARE HOTEL, RELAIS & CHATEAUX.